You can bring your love of the forest into your home with these 4 inch Pine Tiles. The Pine tile is crafted to be installed on point, it is 1/4″ thick to pair easily with natural stone, commercial tile or Fire Creek Clay field tile. Incorporating this tile into your project will surround you with all that you love about the wilderness. You can have tile that reflects your personality! Custom tile is for you! 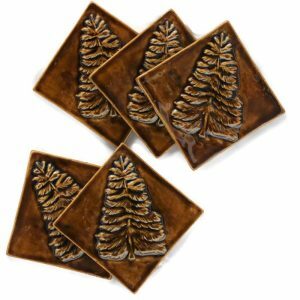 A Pine Tree 4 Inch Tile perfect for a country cabin or home. The Pine tree, being evergreen reminds us of eternity of love and family. A beautiful tile as an accent, highlighting the ruggedness of slate stone or tumbled travertine, in a kitchen. Pair with the 8 Inch Wilderness tile for a bold statement or with the Pine Bough 1 x 4 Inch tile for a more subtle affect. Each tile starts as a slab of clay, hand carved and cast in plaster. Take a moment to read about our tile process HERE. Fire Creek has several glazes to choose from to compliment any tile installation and décor. Our tile is 1/4 in in thickness to pair easily with natural stone, commercial tile or Fire Creek field tile. Find our field tile HERE. We can help you achieve the look of your dreams. We craft every tile just for you so please allow 4-6 weeks delivery. Do you still have questions? You can find answers to our most frequently asked questions HERE. You don’t have to have the same look that all of your neighbors have! Choose the tile that is meaningful to you!